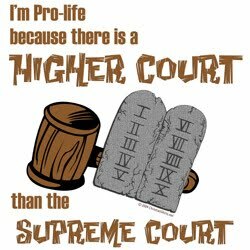 "I'm pro-life because there is a Higher Court than the Supreme Court"! I love the statement! I think it is great to be able to take a stand for what we believe. The best part about putting it on a shirt is that sooo many people will be able to read it...many more people than I could talk to! I picked the blue shirt (since blue is my favorite color :) and I have really enjoyed wearing this shirt. It is so comfortable, and very, very soft. I have noticed a lot of people reading it when I wear it out! 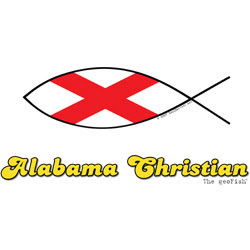 Christian Shirts is a place I recommend you check out if you're looking for a great new shirt. There are over 450 designs, with varying themes. From anti-evolution to pro-life, or fish/flag designs, there are plenty of choices! And they don't just offer their designs on t-shirts either. You can get onesies, magnets, checkbook covers, mugs, coin purses, and more! "On our website, you'll find 400+ original Christian and Pro-life designs that have been specifically created for Christians and Pro-life supporters. If you strive to be on the front lines of the culture and challenge people's hearts and minds, then you have come to the right place. We specialize in Pro-life designs that most other organizations won't touch for fear of alienating a Pro-choice Christian base." Check out the great selection at ChristianShirts.net today!